Many research groups from around the world are investigating ways to create new photoreceptors from stem cells for transplantation into the retina for vision restoration. Audio version: For someone with a retinal disease such as retinitis pigmentosa or macular degeneration, their vision loss is caused by photoreceptor degeneration. Photoreceptors are the retinal cells that capture light and convert it into electrical signals, which are sent back to the brain where they are used to create the images we see. Many research groups from around the world are investigating ways to create new photoreceptors from stem cells for transplantation into the retina for vision restoration. But this approach presents many challenges including risk of immune response to the new photoreceptors, as well as the difficulty in getting them to functionally integrate with the patient's existing retinal tissue. The delicate surgery often necessary for transplanting the new cells can be risky, as well. However, Thomas Reh, PhD, an FFB-funded expert in retinal development and regeneration at the University of Washington, is working on an innovative approach with the potential to revolutionize how scientists go about restoring vision. He's trying to find a way to coax the retina to grow its own, new photoreceptors. 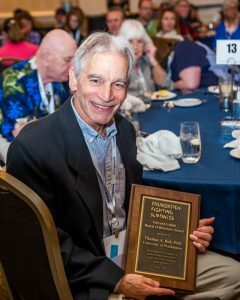 In fact, at the 2018 VISIONS Conference in San Diego, he received FFB's 2018 Ed Gollob Board of Directors Award for his research paper in the journal Nature on the emerging technique, which was inspired by his earlier work with amphibians. "The paper is the culmination of research in my lab spanning more than 30 years. I first learned about the ability of salamanders to regenerate their retinas when I was an undergraduate student at University of Illinois," said Dr. Reh. "There was a professor there, Dr. David Stocum, who studied limb regeneration in these amphibians. I was fascinated that these animals had this potential. When I started my own lab as an assistant professor in Calgary, I began to study regeneration in tadpoles." Dr. Reh's paper in Nature highlighted his retinal regeneration advancements in mice. His team was able to derive neurons from retinal cells called Muller glia, which normally provide architectural support and a number of protective and waste-disposal functions. The new neurons connect with the existing circuits and the cells respond to light. However, the new neurons are not full-fledged photoreceptors, so there is much more work to be done in advancing the approach into a human study. "The FFB is currently funding our research to derive actual photoreceptors from Muller glia," said Dr. Reh. "The next step would be to develop an appropriate gene therapy for humans to direct expression of the protein Ascl1, the catalyst for deriving photoreceptors from Muller glia." Dr. Reh added that safety and efficacy studies in a large-animal model would be necessary before moving the approach into a clinical trial. "While more work needs to be done, Dr. Reh's regenerative therapy is potentially another achievable option for retinal regeneration that has advantages over transplantation," said Stephen Rose, PhD, FFB's chief scientific officer. "He's an innovator willing to look outside of the box. That is important in getting vision-restoring, retinal-disease treatments out to the people who need them."